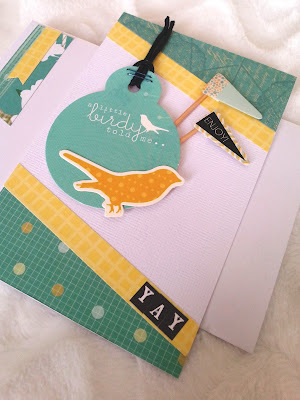 Today I have another card set to inspire you. This is the set I mentioned a few weeks ago that I really struggled with. That really surprised me, as it's not the first set I've made, and I haven't had a craft hiatus or anything. 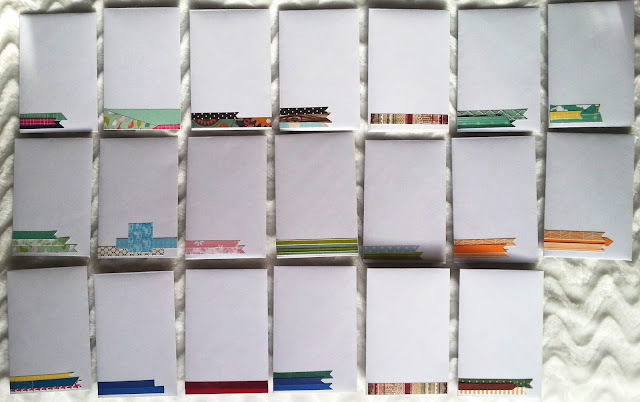 In the past I have used my 6x6 paper pads, and from each pad I have made three cards and then moved on to the next paper pad. I didn't do it that way for my last set, or for this set, and maybe that's why I struggled. I also like to make each one different, each time I do a set, and maybe that is another reason I struggled - as each set of 20 I make could be the same as each set is for a different person. I will apologise now for the quality of the photos - as it took me so long to make them, by time I finished I had to photograph them in poor lighting right before they were taken away to their new home! No option to retake any photos either. So sorry about that. 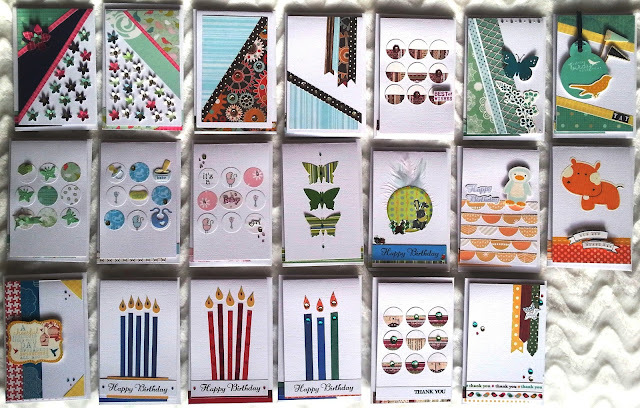 All these cards are made from my paper scraps box, as you only need smaller pieces of patterned paper to make a card. I made personalised envelopes for each card. It's the first time I've done that for a card set. 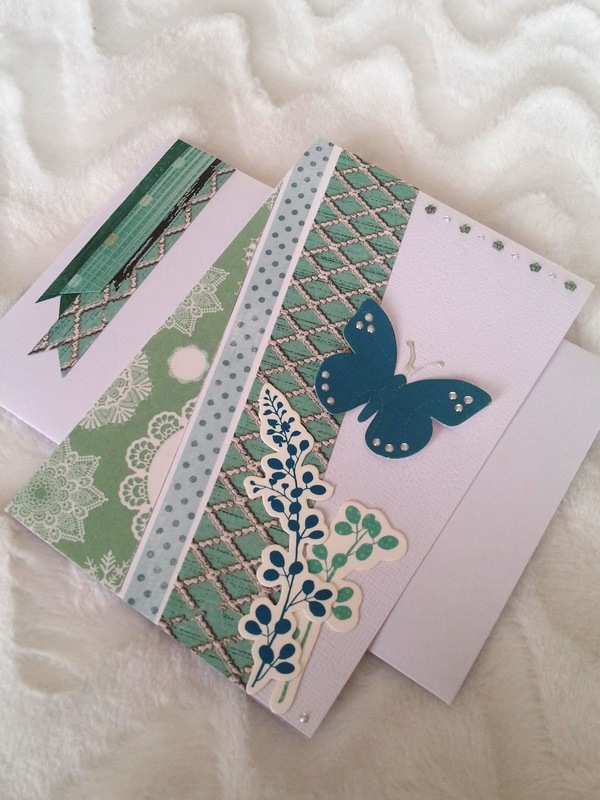 It's just a simple little addition of a paper strip or two down one side of the envelope using the same patterned paper used on the card. 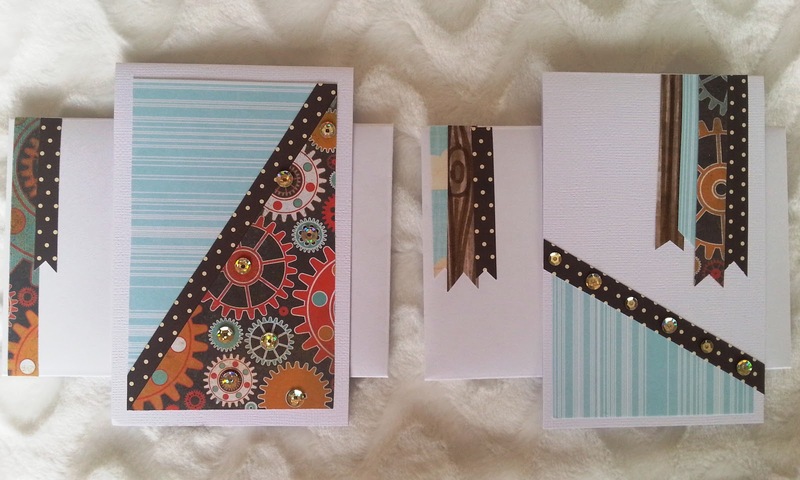 I made some cards like this last time and really liked them. 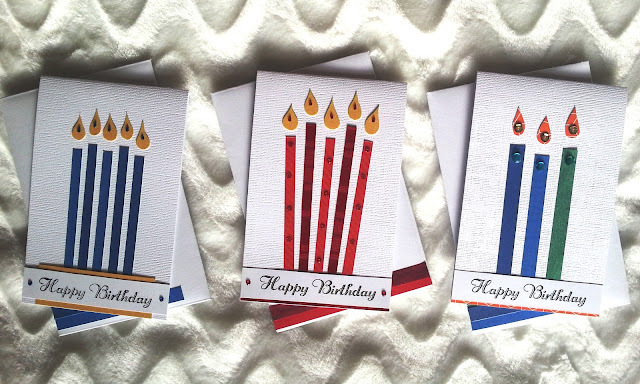 The candles are just paper strips which I have decorated with gems colour on colour. And of course a hand drawn and hand cut flame with a gem glued to each for added sparkle. Three unisex children's cards in a range of designs and colours. The similar feature of each is the inclusion of an animal. 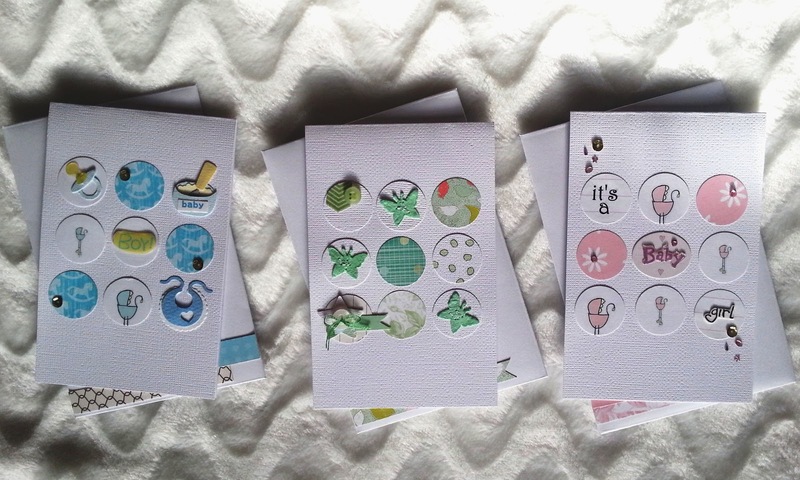 Three baby cards, all made in a grid of nine circles. Some of the circles are punched from patterned paper, while the others are white cardstock. Each of the nine circles is decorated in a monotone fashion. A pair of masculine cards. I started with the patterned paper with the gears on it and that was the base of my colour palette - I chose the aqua and brown papers to match. Decorated with gold sequins - in the centre of the gears on the left hand card and along the brown paper strip on the right hand card. 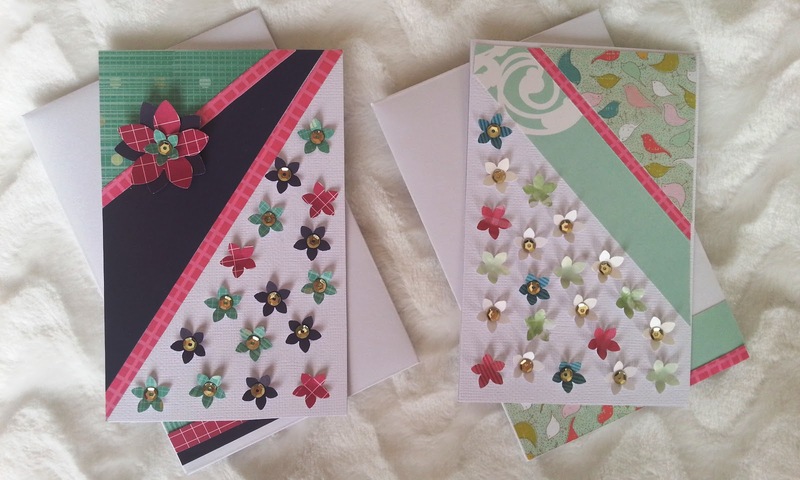 A pair of feminine cards. I love these. I have made some similar in the last year which is where I drew my inspiration from. I very seldom use my flower punch, so I enjoy making them! You can't really tell, but each flower petal is curled up, so these cards are very dimensional. The gold sequins top them off beautifully. A unisex, multipurpose card. Always handy to have a couple like this. A celebratory card - birthday, new job, new house - lots of options. 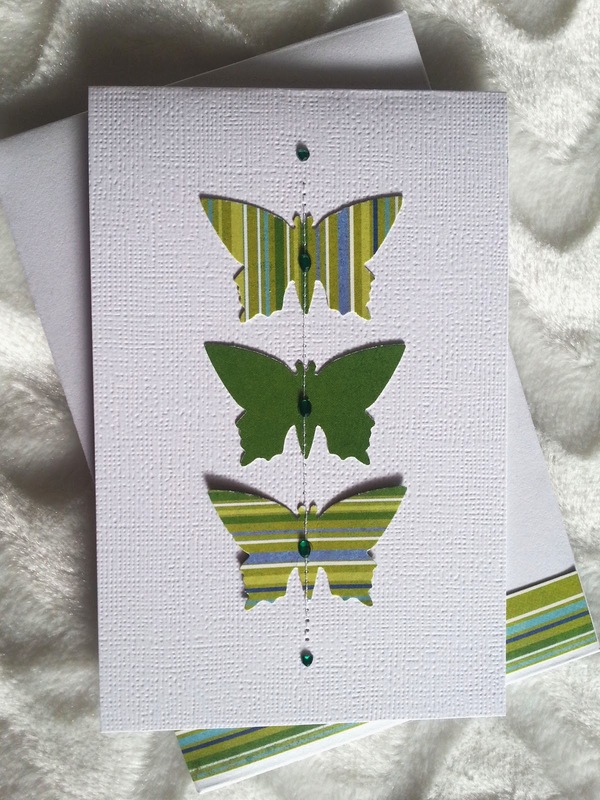 The last card to show you is this card with a simple design and gorgeous colour palette. 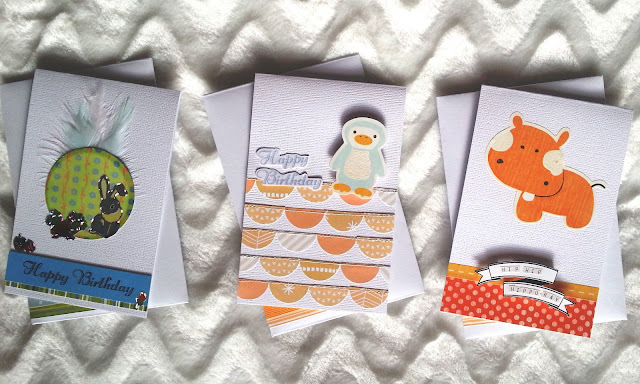 You will notice that the majority of my cards have a colour palette consisting of only two or three colours, plus white. This makes them look more streamlined and cleaner. Thank you so much for stopping by today. I hope you have found something to inspire you. Please leave me a link to your blog if you make a project inspired by something you see today.